Hi there! My name is Robert Occhialini. I’ve been updating this site sporadically since November 1996, making this site one of the earliest blogs on the web. Not all of those archives are currently online. I hope to get them up here at some point. I’m working on it once in a while, but I’m distracted by the now. I’m a father to two boys, and husband, and live in Decatur, GA. I love Decatur. I grew up in Connecticut, but have made peace with living in the South. I’ve been a Mac guy from 1987 on, and worked as a writer and editor on some of the earliest Mac sites on the web because of my love for the platform. 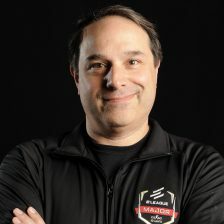 During the day, I am currently working on esports and ELEAGUE for Turner Sports as their VP, esports Products and Technologies. I prefer my unofficial title, which is “Chief Nerd.” I’ve been a gamer all my life, and it just made sense to work on esports given my background, and its rise in popularity. I previously worked on products that help people enjoy the sport of professional basketball working for NBA Digital as the VP of Digital Products. My focus there was on the NBA apps and NBA League Pass products business on the web, iOS, Android, and TV Connected devices. You can read more about that on my LinkedIn profile. This site is mine, and the opinions I express here are mine alone. Turner Sports is not on the hook for any of my opinions or mistakes. If you want to get in touch with me, I am @bump over on Twitter. That’s honestly the safest way for us to get to know each other. I also post a lot of pictures to Flickr and Instagram. I’ve loved photography my whole life, and was the kid with his own set of keys to the darkroom in junior high. You won’t see any ads on this site. I may, from time to time, include referral links to items or apps I recommend. This site is just something I like doing, and I am not looking to turn it into anything more. Yankees. Atlanta United. Lakers. Falcons. This site, and those social media accounts, have nothing to do with the NBA, NBA Digital, ELEAGUE or Turner Broadcasting, or any other employer I have had. The opinions that I express here are not theirs, they are mine alone.